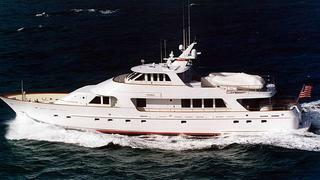 Kevin Merrigan at Northrop & Johnson in Fort Lauderdale sends in details of his latest listing, the 33.53m motor yacht Onika, a joint central agency for sale with his colleague Gregg Child. Built by Delta Marine in 1993 to a design by Stephen R. Seaton and refitted in 2004, she's been well maintained throughout by her owner and crew. A Glade Johnson interior sleeps six guests in three staterooms plus five crew berths while twin 1450hp Caterpillar engines give Onika a crusing speed of 14 knots and a range of 1,880 nautical miles. Kevin says the owners are ready to sell as they're building another superyacht at Delta Marine and, lying in Newport, Rhode Island, Onika is new on the market asking $4.9 million.